For those riders looking for high level street protection, Dainese has a new option for 2017 in the form of the Dainese Assen VR46 Gloves. Inspired by the track they share a name with, these gloves will even get riders to the track, so protection is there when you need it. Designed for the sport-oriented street rider with aggressive pre-curved fingers, the Assen VR46 Gloves have a full leather construction, polyurethane knuckle armor, hard palm sliders, and a reinforced palm. These features combined result in a CE Level 1 certification for the whole glove - something we are just seeing starting to hit the market this year. For comfort, there are elasticated inserts on the thumb to allow a wide range of movement, and to fit a variety of different hand types. 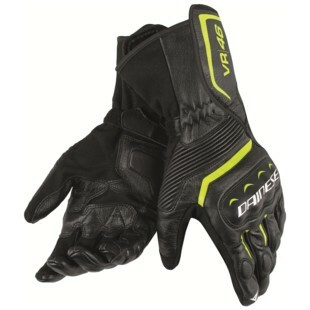 With CE Certification, a full leather construction, hard armor protection, and a long cuff design, the Dainese Assen VR46 Gloves are a highly technical, street riding glove that are equally at home during the commute and on track. For those of us who know how many hazards there are when commuting, this is a welcome addition to the Dainese catalog for 2017.